Home → Building Standards and why they are Important? → Can you prove ‘fitness for purpose’? What happens if you sell a bath or shower seal which doesn’t work? In a typical British home with an upstairs bathroom and a timber floor, your DIY customer only finds out that it isn’t working when water damage becomes evident on the ceiling below. Up to now, the cost of repairing that damage has rested with the customer – but that may be about to change. The Sale & Supply of Goods to Consumer Regulations 2002, which came into force on 31st March 2003, brings in the ‘reverse burden of proof’ – with direct implications for retailers in regard to product liability. Competition for shelf space is so intense that some sealing products being promoted are more focused on ‘saleability’, than meeting the relevant British Standard, or even basic ‘fitness for purpose’ obligations under The Sale of Goods Act 1979. Consider my own field: bath and shower seals. 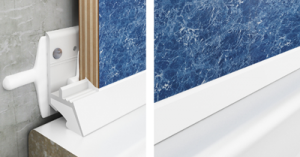 BS 5385 Part 4 (domestic showers) advises that movement joints should be considered at design stage, and that special attention to be paid to sealing the gap between wall and base, particularly over suspended floors. But some sealing products being promoted in the DIY sector are more focused on ease and speed of installation to attract a sale, rather than meeting the requirements of the British Standard. For instance BS 4305 Part 1 says the maximum permissible deflection on the roll of an acrylic bath with an integral support structure, after base loading, is 2mm. In a new house, post-kiln joist shrinkage can account for another 2mm. We can therefore assume that in a new house with an acrylic bath installed upstairs over a timber joist floor, the gap between the wall and the edge of the bath may vary in use by up to 4mm. Silicone is the most frequently used sealing material today –and silicone manufacturers generally recommend adherence to BS 5385, which says that silicone has a Movement Accommodation Factor of 25%. In other words, to allow for joint movement of up to 4mm, a silicone seal needs to be at least 16mm wide. But the gap between a typical shower tray or bath ledge and the adjacent wall is seldom more than 10mm. And in any case, an exposed face of 16mm of silicone is just too unattractive.Exposed silicone is a magnet for dirt; it is unhygienic and needs regular cleaning. What’s the alternative? 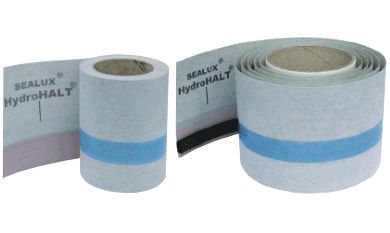 Well, one, which is strongly promoted in the DIY sector, is the pre-formed sealing strip which relies on a flexible lip to form a pressure seal with the bath ledge. But wait a minute: BS 5385: Part 3, Section 3 19.4, says that pre-formed strips are suitable for use in stress-relieving or compression joints where a watertight seal is not critical. 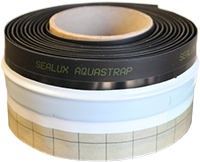 It implies that if a watertight seal is critical, pre-formed strips are unsuitable. Furthermore, the joint between a bath and wall is not a compression joint. 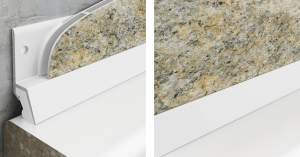 Relying on the flexible lip to maintain a constant watertight seal with a bath ledge that is expected to pull away from the lip, leads to the obvious conclusion that the effectiveness of the seal will be at least diminished. The weight of evidence suggests a pre-formed seal is not ‘fit for purpose’ as a watertight seal over a movement joint in the normal shower environment. Why does all this matter? Well, as of March 31 2003, when the new regulations came into force, the ‘reverse burden of proof’ applies. In the event of a dispute in the first six months after purchase over the‘fitness for purpose’ of a product, the retailer now has to prove to the customer that the product was ‘fit for purpose’. And there is no onus on the customer to prove otherwise. Moreover, if the customer’s property is damaged as a result of using a product which is subsequently found to be unfit for purpose, the consumer may seek damages from the seller as consequential losses. In the case of bath and shower seals, this could include the cost of repairing any damage arising from a leak. And this applies up to six years after the purchase, or five years in Scotland. Suppliers who have sacrificed ‘fitness for purpose’ over ‘saleability’ can no longer hide behind a complicated and costly legal system that has deterred customers from seeking compensation. The last place of refuge is now directly behind their retailer’s reputation, which in turn hangs precariously on the assumption that their supplier’s products are ‘fit for purpose’. Don’t risk your hard earned reputation. Asking suppliers to provide proof of fitness for purpose should form a fundamental part of the buying process –especially where the potential cost of product failure is high. If your supplier can’t prove their product is fit for purpose, there is a reason – so look elsewhere!